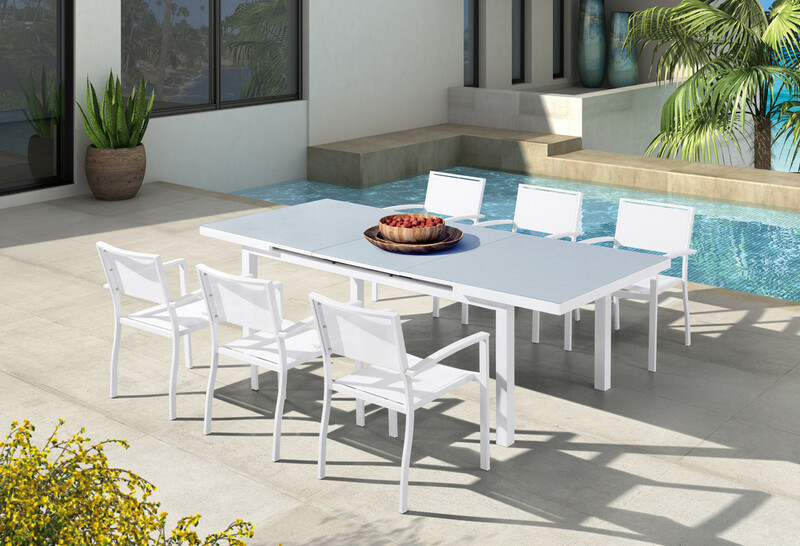 The Tybee Outdoor Dining Set is the perfect fit for family BBQ’s, the table is extendable and it includes 6 chairs. It can extend to 24”. 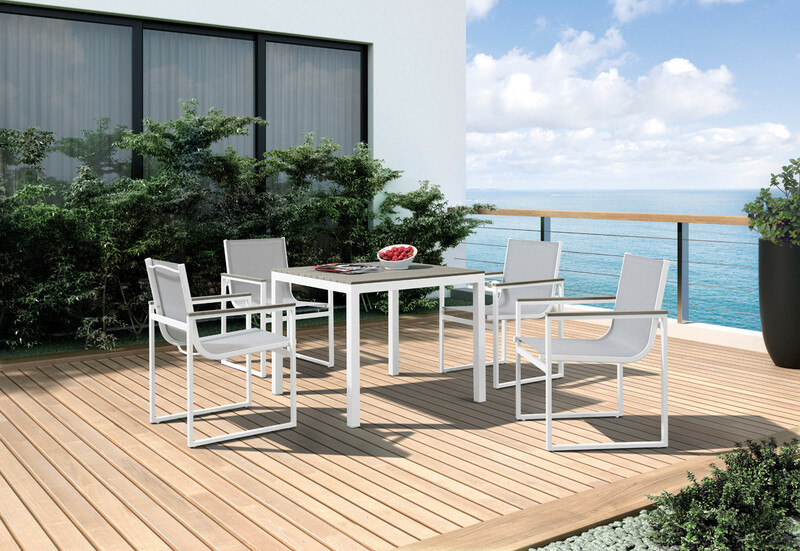 It comes in white powder coated aluminum frame, white textilene slings, and a high pressure laminate table top. Its design can look great in any outdoor space because it can blend in and can be combined with decor to bring it more to life. Lounge in style with our new Boardwalk lounge chair set. It includes 2 lounge chairs and 1 side table. 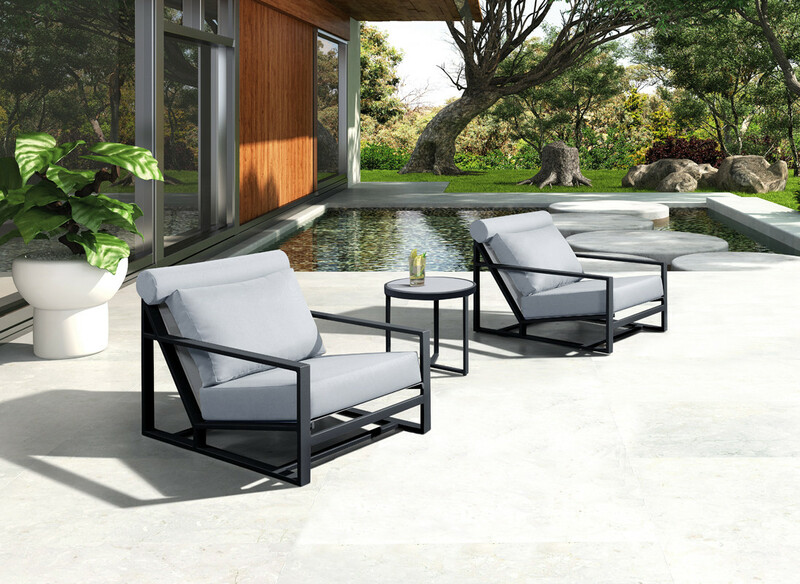 It is made with a black powder coated aluminum frame, grey waterproof polyester fabric covered cushions. The side table is round with a black powder coated frame as well and a grey stone glass top. This design is very comfortable and modern, the warm grey color of the cushions allows the chairs to have more of a beach vibe. If you have a medium size home and have more of a balcony or patio area, then the Gulf outdoor dining set is the the right fit for you. It comes in white powder coated aluminium frame with grey waterproof textilene sling seats. It includes a small square table with a polywood top and four chairs. This design has a fresh color that can be combined with with neutral or summer colors. If you have a smaller size home with an patio space? No need to worry, the Gulf also comes in a bar table set that fits perfectly in smaller spaces. It includes the bar table and two bar chairs. 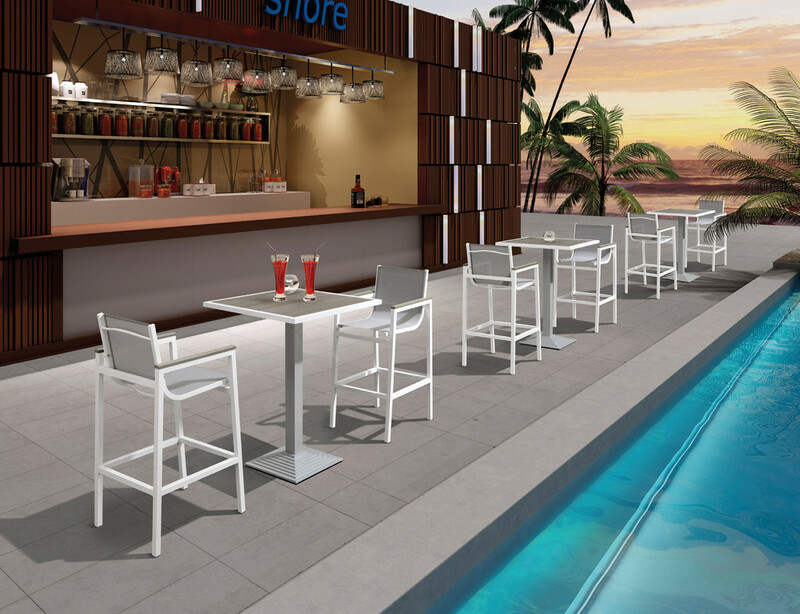 The materials are the same, white powder coated aluminum frame and includes a pedestal with grey waterproof texilene sling chairs. The bar table is squared with polywood top and armrests. You can combine both sets or buy them separately to fit in your outdoor space. Small or big, LA Furniture Store has furniture that can be used in all outdoor spaces. It’s the season for patio furniture so why not have a look?